Cuttlefish, like their cousins squid and octopus, are cephalopods (from the Greek: kephalos (head) and podos (foot)). They really are incredible creatures (Jack’s obsessed with them) capable of changing not only the colour, but the texture of their skin. The cuttlebone (that you see on beaches and in budgies' cages) is used to maintain neutral buoyancy, allowing them to hover around using their skirt fins- they also use jet propulsion for short bursts of movement. Cuttlefish, like squid, have eight arms and two tentacles, which they shoot out to capture prey. They’re voracious predators and will eat pretty much anything from small fish to crustaceans. After breeding, female cuttlefish lay individual eggs which are fastened, one by one, into rocky cracks and crevices. Females often die after spawning, though males may hang around to defend the nest site. In the Channel, cuttlefish are normally caught in the spring, when they congregate to breed. They’re mainly targeted using ‘traps’, although they often end up in the static nets at this time of year. Traps are similar to crab pots, but use a live female as bait to ensnare the unwitting males. While the targeting of spawning aggregations is not something we’re big fans of, studies by the Sussex Sea Fisheries Committee have judged the level of fishing well within sustainable limits. They’ve also started to lay artificial substrate in breeding areas to provide a safe place for eggs to develop away from greedy predators. Cuttlefish are nearly all exported to the continent, but the Eurozone crisis has made this more difficult, so we need to develop a market for them here in the UK, something we're happy to do. 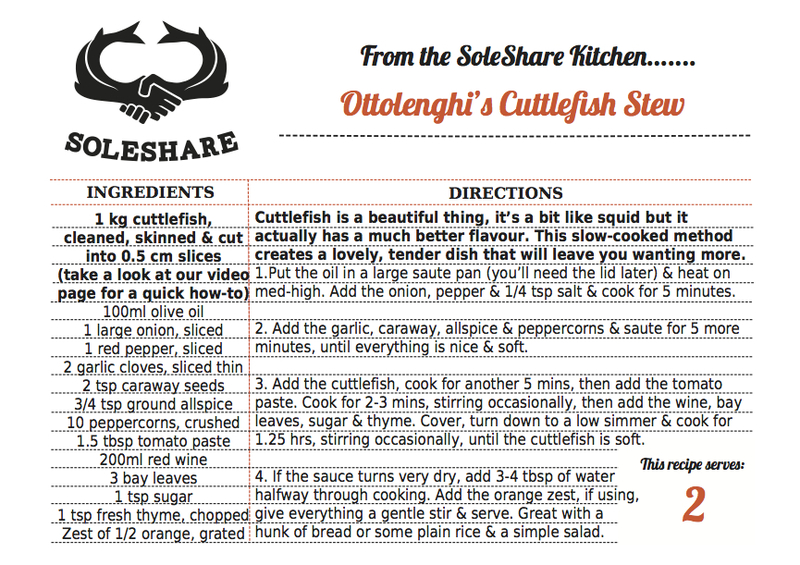 Think of cuttlefish as a slightly meatier, less rubbery squid (sounds good, right!?). They take well to quick cooking at high temperatures, as you would with squid, but also hold up well to low, slow braises. Cleaning a cuttlefish is fairly straightforward, but it must be said, messier than cleaning a squid. We find it easiest to do most of the initial, dirtier work in the sink. Have a look at this video before you start and bare in mind, our cuttles are slightly bigger than their Australian counterparts and you might need make a small incision with a knife to remove the cuttle bone.